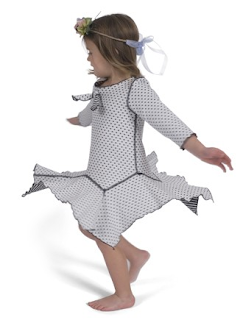 Happy Green Bee is a New (TO ME) company that makes beautiful Organic Clothing for Children. Clothing made with organically grown cotton does not retain toxic residues; it is a pure, natural, and breathable fiber. My children suffer from eczema, and once I switched mainly to organic (no not all of their clothing is organic only pieces) I noticed that Their skin wasn't bothering them as much so either it is a strange coincidence or the Organic really made a difference, I''m going to go with the Organic made the Difference!! One side is White with Black polka-dots and the other is Black and White Stripes!! This dress is just so adorable! The Material is so soft and just by the feel of it I know that it will be a sturdy fabric that holds up in the wash! and My favorite part about Happy Green Bee's clothing is that unlike most organic clothing that is normally blah and mute in color, their clothing is Bright and Vibrant and whimsical just plain fun it reminds me of what a child would actually design and love to wear! Overall Happy Green Bee is a great, fun shop for Organic Children's clothing! Leave a separate comment for each please!! Giveaway ends October 25th at midnight! I like HGB on FB. Thanks! I would pick the petal dress. I like Happy Green Bee on Fb as Tanya Hebert. I'd pick the Chemise shirt in Watermelon/Sky color. Sock gift set: classic stripes. i like the Petal Dresses. I like the Pixie Pant. I like Mama Love on Facebook. Awesome collection of clothing has been shared in this post i love to take good knowledge of clothing and this article has provide me something special and the writing of it also unique..